The Interdisciplinary Training Program in Rehabilitation and Neuromuscular Plasticity, funded by the National Institutes of Health (NCMRR) was initiated in 2003 to help build a critical mass of well-trained scientists prepared to conduct innovative rehabilitation research. This pre-doctoral training program is unique in that it emphasizes the interaction and joint training of rehabilitation clinicians and basic scientists with a common interest in translational research in neuromuscular plasticity. Trainees are selected from a pool of outstanding students with diverse backgrounds and are admitted by one of five graduate programs: Rehabilitation Science Doctoral Program, Biomedical Engineering, Applied Physiology and Kinesiology, Graduate Program in Biomedical Sciences, MD-PhD Training Program. The Neuromuscular Plasticity Training program (NMPT) is specifically designed to provide pre-doctoral trainees with the foundation and skills needed to become independent investigators and future leaders in rehabilitation. Upon entering the program, each trainee prepares an individualized career development plan under the guidance of an experienced Faculty Mentor and Translational Research Co-Advisor. The individualized plan consists of a structured didactic program, specialized courses, journal clubs and seminars, laboratory research and multiple scientific dissemination experiences. Trainees learn cutting-edge research methodologies and acquire extensive research experience. Most importantly, they generate, analyze, present and publish research data. In addition to the close mentorship provided by the faculty mentor and translational research co-advisor, the trainees benefit from close interactions with clinical and basic science faculty participating in established Collaborative Translational Research Partnerships. The NIH National Center for Medical Rehabilitation Research T32 award at the University of Florida College of Public Health and Health Professions is under the direction of Program Director Dave Fuller, Ph.D., Krista Vandenborne, PT., Ph.D., Translational Science Advisor, and Andrew Judge, Ph.D., Curriculum Coordinator. The Director and Co-Directors are assisted by an NMPT Internal Steering Committee and a large group of Faculty Mentors. The NMPT Program Administration is housed in the Department of Physical Therapy and coordinated by Laura Quintana, Coordinator, Academic Support Services. A total of 31 basic and clinical rehabilitation scientists with a strong record of scholarly productivity and grant funding serve as faculty mentors on the NMPT program. Each trainee is assigned a Faculty Mentor and Translational Research Co-Advisor. The faculty Mentors encompass a wide spectrum of rehabilitation research interests and expertise, from evidence-based practice to systems physiology, biomedical imaging, and translational molecular therapeutics. Many of the 32 members of the training faculty have a history of interdisciplinary collaboration in research grants, peer-reviewed publications and joint sponsorship of students and postdoctoral fellows. Collectively, over the last four years the NMPT faculty have provided mentorship to more than 60 pre- and postdoctoral fellows, supported by a variety of funding sources. The incredible synergy and long history of collaboration between NMPT clinical and basic science faculty mentors have led to the evolution of several productive Translational Research Programs, which are well integrated within the NMPT program. 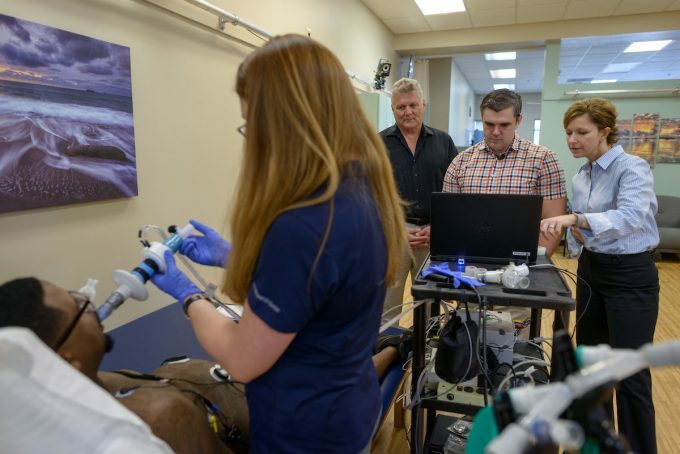 The NMPT didactic program is designed to fill graduate program curriculum gaps in the areas of neuroplasticity, rehabilitation, exercise physiology, and translational research. Other needs of students that are not uniformly met by departmental curricula are the ethical conduct of research, training in scientific dissemination, and grant writing. To meet these needs and to ensure a common foundation of knowledge across trainees each predoctoral NMPT trainee will take a set of required courses, supplemented with specialized, elective courses. In addition, each trainee is required to attend and participate in regular interdisciplinary seminar series, discussions and journal clubs focused around neuromuscular plasticity and rehabilitation. To ensure exposure to both clinical research and basic science methodologies, all trainees are also required to spend at least one semester in the laboratory of the Translational Research Co-Advisor. Most trainees will have extensive interaction with several clinical and basic science faculty mentors throughout their training. Finally, trainees will present their research during a formal graduate seminar series (Neuromuscular Plasticity Noons) and at the Annual NMPT Symposium. Trainees also will attend national and international scientific meetings within their areas of expertise. The stipend for this program is currently $24,324 per year. The grant also covers tuition/fees, health insurance, travel funds, and training related expenses.